The newly-proposed changes include deepening the Columbia Basin, reintroducing recreational boating to the basin, and bringing back Jackson Park’s old canal and lagoon system. The Jackson Park District Board of Commissioners accepted a revised Lakefront Framework Plan last month to guide development in the South Side’s lakefront area, which planners updated to account for the arrival of the Obama Presidential Center, infrastructure changes, and the merging of the Jackson and South Shore golf courses. Among other changes, the revised framework plan proposes to deepen the Columbia Basin behind the Museum of Science and Industry (MSI) and reintroduce recreational boating to the basin. The plan also suggests bringing back Jackson Park’s old canal and lagoon system and a new beach house at the South Shore Cultural Center. Important to note is that the Framework Plan does not include a budget. It is more of a set of guidelines to direct upcoming development in Jackson Park, Washington Park, and the South Shore Cultural Center in coming years. Jackson Park’s lagoons were an integral part of Frederick Law Olmsted’s vision while he was designing the landscape that is now Jackson Park in 1871. The revised Framework Plan suggests the restoration of these lagoons and the addition of boardwalks and “harborwalks” in order to make them more pedestrian accessible. The plan also proposes to create a bayou linking Jackson Park’s Lagoon to the Inner Harbor, which currently hosts a mix of motor-powered boats and smaller, manual crafts. The plan emphasizes the ecological impact of its proposed water additions. It seeks to increase eco-friendly infrastructure, bolster native plant communities, add structures to address storm runoff, and to employ “living shoreline strategies” to make the lakefront and lagoon areas healthier and more environmentally sustainable. Other sustainability measures in the revised plan include the addition of “breakwaters”—short ledges scattered through the shallow waters—to the lakeshore, meant to make shorelines calmer and promote a more robust ecological diversity. 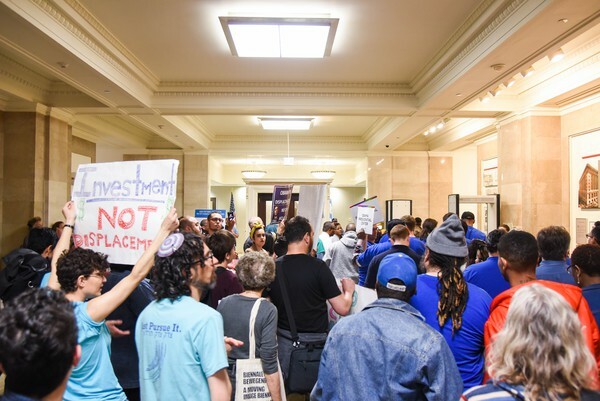 Some version of a framework plan has been in place since 1999 as guidelines for development in Jackson Park, Washington Park, and South Shore Cultural Center. This revision is the most extensive to take place since the plan’s inception, and sets new goals for the area’s development, given that many of the original plan’s proposals have been carried out. People rally before Obama Foundation plan commission hearing at city hall on Thursday. “The framework plan’s purpose was to define the changing needs of these parks, to provide a plan to enhance each of the park’s commitments to serving the neighboring communities and to preserve the intended historic character,” the plan’s website reads. However, the impending arrival of the Obama Presidential Center and increasing development in Jackson Park, most prominently the addition of a Tiger Woods–designed golf course, necessitated an update to the plan. “A key impetus for updating the plan was to integrate several major projects that had been proposed for the South Lakefront: the Obama Presidential Center in Jackson Park; the merger and restoration of the Jackson and South Shore golf courses into one premier 18-hole community course; and necessary roadway changes,” reads the website. The Obama Center will be at 60th Street and Stony Island Avenue. The Obama Foundation, the organization developing the Center, has emphasized the site’s integration with the lakefront. 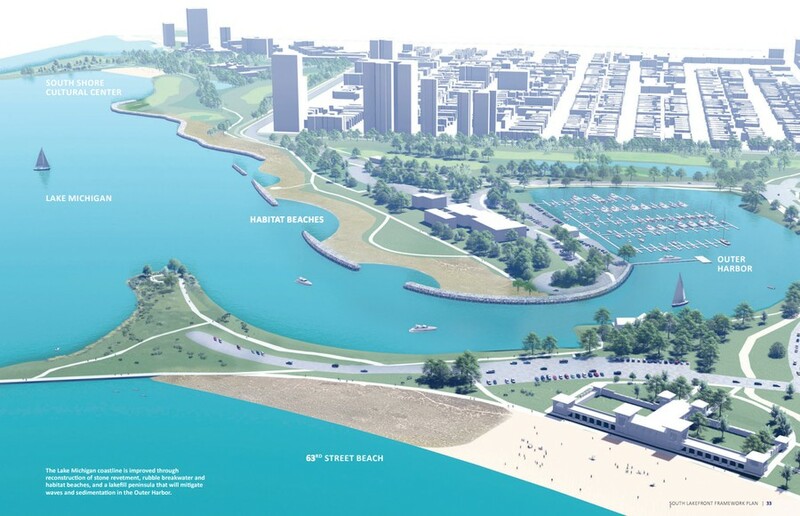 “The campus will remove barriers and seamlessly connect the park to the lakefront, and will be unified with other local South Side institutions,” their website says. The South Lakefront Framework Plan website has not yet been updated to reflect the plan’s approval by the district commission. The Chicago Plan Commission will hear the Obama Center’s proposal and decide whether to give the Obama Foundation a long-term lease on 19.3 acres of land on May 17. The Chicago Park District Board of Commissioners was not available for comment.